Incorporate apples into a tasty dessert or main dish. Do something inventive that perhaps we’ve never seen before. Last fall, I did an apple taste test where I took my favourite apple variety (gala at the time) and put it up against a bunch of other similar looking apples – ambrosia, fuji and honey crisp. 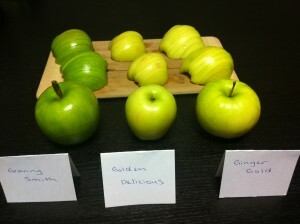 Before doing that taste test I had no clue as to the different taste varieties and flavours associated with each apple. Which type of apples do I like eating the most? Interestingly enough, I choose different varieties depending on what I’m making. For raw apples I like crispy, sweeter apples such as gala, ambrosia and honey crisp. For applesauce I prefer softer apples such as MacIntosh and Spartan. For apple pie, I find that a combination of apples works best. But I would not have realized what a great variety we have in terms of flavour had I not done these apple tastings. Interestingly, most people were surprised at how sweet the Granny Smith was. Like me, they remember Granny Smiths as being very tart almost to the point of sour. But today, the Granny Smith we had was tart without being sour, even sweet. It was very refreshing. An individual in the taste panel who prefers Granny Smith says that the trick is to pick the ones that have the appearance of tiny spots appearing on their skin. She claims that these are the sweeter ones (at least this is a rule that she goes by). The Golden Delicious were sweet but not as crunchy as the Granny Smith. Most people didn’t like the soft texture of the Ginger Gold but if they just focused on the flavour they actually preferred the flavour profile of this apple the most. One of the taste testers said that she has had crispier Ginger Golds in the past and doesn’t like it when they get soft. Knowing this, I think that the Ginger Gold would make a really tasty applesauce. I would eat them raw if they were crunchy but if they started to go soft, I could easily make them into applesauce. This was a great taste test. I usually stick to Gala and Fuji’s but it was nice to open things up to green apples once again. I was pleasantly surprised by the Granny Smith so I might pick those up once in awhile when I feel like something different and will try the Ginger Gold if it looks firm and crunchy. « Kale chips	» Butternut squash soup – Mmm Mmm, Good! Granny Smith: Crisp and tart. Tastes refreshing. This one is tart with a hint of sweetness. Funny, I have never been much of a Granny Smith fan but today I am liking this one. Golden Delicious: Crisp but not as crisp as the Granny Smith. Tastes sweeter than the Granny Smith. This is also a nice tasting apple. Ginger Gold: This apple is very soft and mushy. I really don’t like the texture. Tastes similar to Golden Delicious but I am really not a fan of the texture. Today I like Granny Smith the most because of the crispiness. This is very important to me in an apple. I’m embarrassed to admit that apples are one of the only fruit that I eat and I’m pretty picky of the type of apples that I eat. The granny smith apples are almost always delicious. Crisp and tart – I like it! The Golden Delicious were not as crisp nor did it have such a distinct taste. It seemed to be a bit watery. As for the Ginger Gold I really really really didn’t like that one. The apple was very mushy and the taste was bland. I prefer Ginger Gold for flavour but Golden Delicious for texture. I usually eat them raw. Occasionally I will eat apple pie. The Golden Delicious was crispy. I haven’t eaten these since I was a kid but I actually did enjoy them, more than I thought! It has a good taste and texture. The Ginger Gold was just too soft. No winner here. Texture in apples is everything, particularly if you are eating them fresh.